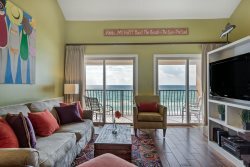 This super cute newly remodeled condo is just across the street from the beach with nice views of the gulf. The bedroom is a king master. You'll find twin bunks built-into the hallway, and the sofa in the living is a sofa sleeper. This condo will sleep up to six people (adults and kids) or a maximum of 4 adults. This condo has been professionally decorated by one of the best and is sure to be loved by kids and adults alike. There is a smart TV in the living room and TVs with DVD players in the master bedroom and also the hallway bunks! Amenities at Grand Caribbean East include a pool and hot tub.